Juan is a nine-year-old boy who loves spending quality time with his family and playing with his sister. He was diagnosed with acute lymphoblastic leukemia in July 2016 and is currently receiving treatment at Advocate Children’s Hospital in Illinois. Juan’s disease has severely impacted his family’s financial stability. His mother worked in a plastics factory prior to his diagnosis. She gave up this role to be her son’s full-time caretaker and stand by him during his countless medical appointments and treatment sessions. This left Juan’s father as the sole income provider for their family of four. A landscaper by trade, he was out of work for five months during the fall and winter due to inclement weather. Adding to the financial stress was the location of Juan’s treatment. The family regularly traveled 30 miles each way to Advocate Children’s Hospital. This considerably increased their gas costs and added much wear and tear to their car. Coupled with the loss of income, the family soon began to worry how they were going to make ends meet. Juan remains positive during his treatments. Family Reach was made aware of their situation, and our generous supporters ensured that Juan’s family received the help they needed. A grant was issued covering several of the family’s rent payments. This allowed them to stabilize their finances and focus their attention on Juan’s wellbeing. 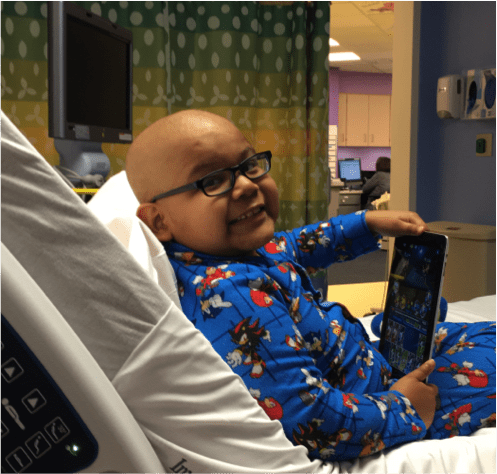 Click here to help families like Juan’s get to the other side of cancer.